An admirer of French Impressionist painter Claude Monet and his famous bridge paintings such as Bridge at Argenteuil and Waterloo Bridge, Ellen Diamond shares his fascination for bridges. This summer, as she painted a picturesque bridge on the Seine River in Paris, Diamond reflected on the beauty of bridges much closer to home. Her thoughts drifted to the graceful charm of the Ortega River Bridge. Upon her return from Europe, Diamond set out for Ortega with her camera, sitting in the park for hours and capturing the changing play of light on the bridge as day turned to dusk. 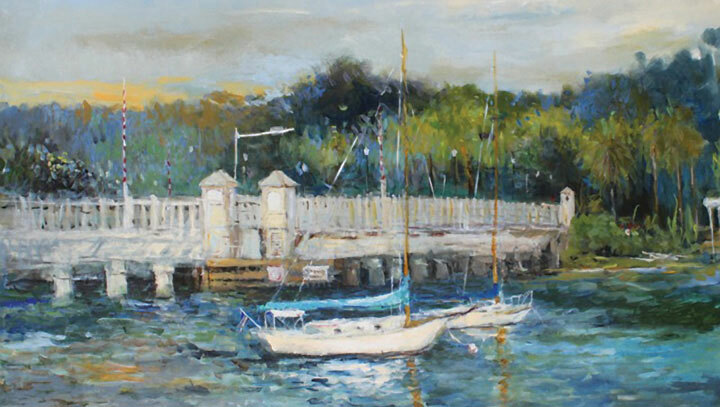 Her resulting painting of The Ortega River Bridge has a soft, ageless quality that transports one to the end of a long, lazy summer day of sailing on the river. The waning sun is reflected in soft luscious shades of blue and gold and green as sailboats approach the historic old drawbridge. The painting is a sensitive, nostalgic depiction of a cherished land mark, one that has inspired artists and photographers since it replaced the old wooden bridge in 1928. “That bridge calls to me,” said the artist. “It is so well done – constructed in such a way that it catches the light from every perspective.” Diamond first painted the Ortega River Bridge back in 1999, when she was doing a series of four local bridge paintings. In addition to the Ortega Bridge (sometimes called the Old Ortega Bridge, sometimes called the Ortega River Bridge), the series included The Main Street Bridge, The Bridge of Lions and The Old Palm Valley Bridge (that has since been demolished). That spectacular series of bridge paintings is now a permanent collection of the Mayo Clinic. A “bridge hunter” with unlimited vision and scope, Diamond has painted footbridges and oriental garden bridges, bridges in Maine and Long Island, Venice and Paris, and several more bridges on the First Coast. Internationally acclaimed for her brilliant use of color and light in paintings portraying the luxuriant landscapes of Provence and Tuscany, Diamond grew up in Brooklyn, New York, the daughter of famed portrait painter Ben Clements, whose classical sketches of celebrities were regularly featured in The New York Times and The Herald-Tribune. Her beloved mentor, Diamond’s late father is still much in evidence throughout her elegant Sawgrass home, where Clements’ portraits of her grandfather and brother, and her three children grace the walls. His striking self-portrait holds a place of honor in the artist’s home studio, on the wall overlooking the easel where his daughter continues the family tradition of creating beauty on canvas. Diamond’s diverse imaginative artistry runs the gamut from abstract to figurative, cubism to realism, and, invariably, her colorful compositions trick the senses with lively momentum… are those clouds moving, do I detect the scent of lilacs, did that water just ripple? 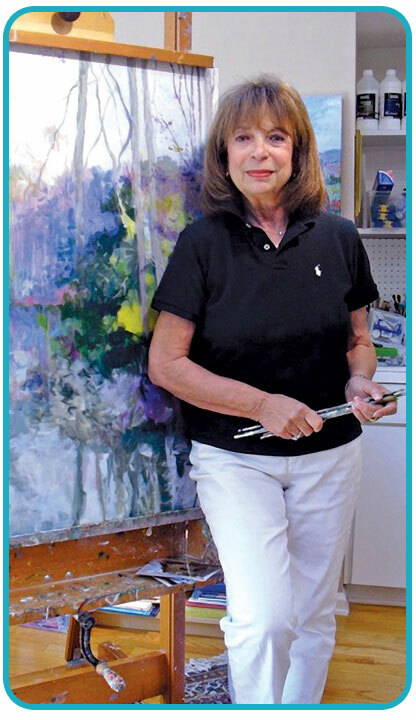 A prolific painter and teacher, Ellen is globally known as an accomplished contemporary impressionist.